Last week, Stefan Schöndorfer and I bolted some two rope-length sport climbs on the Gaisberg crag. These routes complement the easy single pitch routes we bolted last fall. The topo (click on the topo to enlarge and copy) above shows the nine well bolted routes (in bold). The doted lines indicate existing routes that are not up to safety standards due to various reasons. The three two-pitch routes are bolted with a two-bolt belay at the mid-point. there are rappel anchors for each of the routes. Additionally, we also bolted a near by rock outcrop that is designed for rope technique practice or for young children to climb on. This time around, we worked for a total of about 11-12 hours, replacing lower-offs, cleaning vegetation and loose rock and of course putting up the routes. All together we put in 12 lower-offs and easily more than 50 bolts. The hardware was donated by Stefan through his climbing school denkundstein, and we donated our time, energy and know-how. 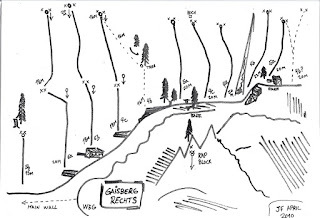 We will be using the new routes for Kletterhalle Salzburg outdoor courses. The course offerings include a basic outdoor course called, Baseclimbs, and a course for those wanting to do multiple rope-length bolted routes, Mutipitch. 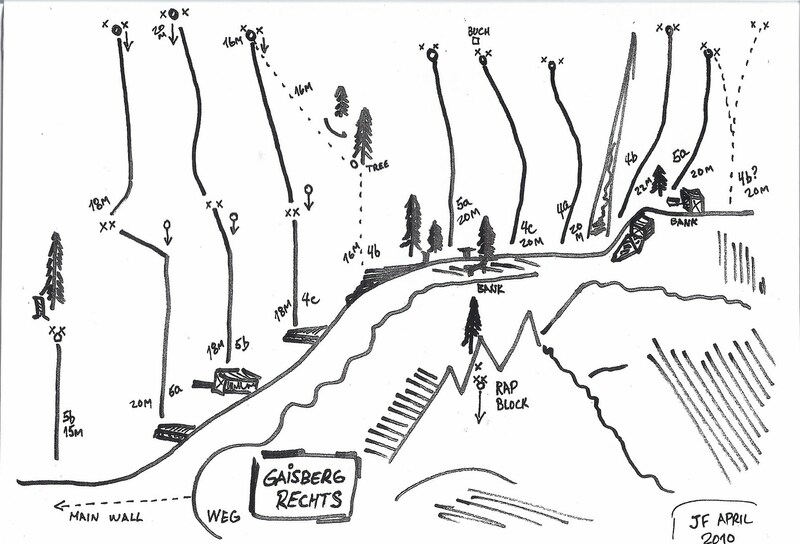 The main compact wall of the Gaisberg is made up of a number of bolted routes of varying safety standards and quality. Stefan was one of the first to bolt the early sport lines on the wall almost 20 years ago. These routes are 6b/6b+ (5.10d/5.11a) or harder and are generally a bit under-rated. The descriptions and topos are published in a number of area sport climbing guide books. denkundstein was granted permission by the city of Salzburg (and other responsible government and private organizations) to monitor and develop the Gaisberg for bolted sport climbing. This is part of a two or three year old initiative on the part of the city to make the Gaisberg a local natural get away on the outskirts of the city for sport and nature activities. We plan on further cleaning up the older routes and putting in more new ones (single and multi-pitch) on the various crags.